LOVINGTON, N.M. – The children point to the bright lights and exciting rides on the carnival’s midway. The agriculture folks look at the wonderful lessons and great experiences with all the exhibits and shows. 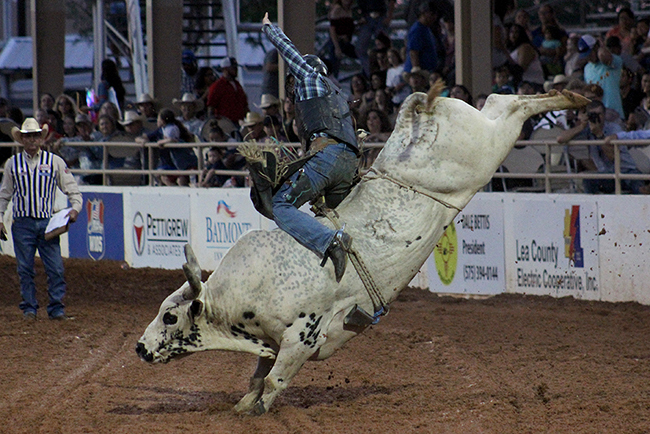 The rodeo fans direct attention to the award-winning and historic rodeo at Jake McClure Arena and the elite contestants that make their way to the area every year to compete for big money. But the biggest factor that makes the Lea County Fair and Rodeo such a success and fairgoers’ favorite is the overall value that comes with this amazing entertainment package, set for Friday, Aug. 3-Saturday, Aug. 11, at the Lea County Fairgrounds in Lovington. Adult tickets are just $10, with children 6-12 getting through the gates for just $5; children 5 and younger are free. “We are able to keep our ticket prices low, because the Lea County Commission underwrites the entire fair and rodeo,” said Kathy Welborn, vice chairwoman of the Lea County Fair Board. “In addition to our great ticket prices, our Wednesday night is Faith and Family night, and there is no admission cost. There is also a big list of local sponsors that help with the financial side of things. Those sponsors are another big reason the ticket prices haven’t risen more than $5 over the last eight years. It’s all about entertaining as many people as possible, which has been the case for more than eight decades. “What makes this event so great is all the planning that goes into it,” Welborn said. “The day the gates open, to see all those kids going through there is amazing. We’re all about the families.